Niagara Falls, like most vacation destinations, will probably require you to pack clothing that’s a bit different from the items you normally wear when you’re at work or play, and for the tourist visiting the Niagara area during the spring months, this is especially true. While the winter snow and ice are certainly in retreat, the warmth of summer can’t yet be relied upon, which means packing will need to accommodate a range of options that include warm, cold, muddy, wet, and windy. If you’re looking to book a stay in Niagara during the spring and early summer, here are some items you’ll need to bring along. During the month of March, the temperature sits around the mid-30s, and while April and May routinely bring sunshiny days in the 60s, the temperature — especially at night — can still dip into the 40s or even lower. Even if your weather app suggests your springtime vacation will be balmy, bring along a coat that will keep you warm should you need to walk back to your hotel after a late dinner in temperatures that are downright cold. It isn’t unusual for a snowfall to hit the Niagara region as late as mid-April, and while these storms rarely result in massive accumulations, if the forecast for your time in Niagara does call for snow, you may want to pack your snow boots. Especially if your itinerary includes any hiking, bird watching, or other outdoor activity, a pair of waterproof boots with stable and solid traction that can handle uncertain footing may turn out to be a godsend. 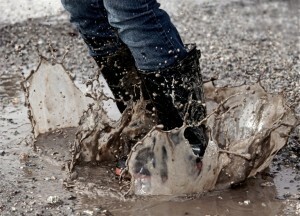 In the spirit of keeping your feet dry, spring in Niagara, like spring in most places, often includes rain showers that are more easily endured with a good pair of galoshes. From running out from your hotel room to quickly pick up a bagel for breakfast to standing on the deck of the Maid of the Mist, rain boots or shoes will come in handy from March through May. Nothing ruins an outing like being caught in a rainstorm or snowstorm, and even if you do pack galoshes, you’ll want to make sure you have a small umbrella that’s easy and convenient to carry with you wherever you go to keep your clothes and head dry. Because spring temperatures in Niagara can be so inconsistent, pack and wear clothing that’s easy to layer so that when you’re chilly, you won’t lose valuable body heat to shivering, and when the day gets warmer than you’d anticipated — or you step into an unusually warm museum, restaurant, or winery’s tasting room — you can swiftly remove a layer or two to remain comfortable. Long sleeve shirts made from thin, moisture-wicking fabrics are great for layering, and while it might not be necessary to employ them, be sure to pack a couple pairs of lightweight thermal tights to wear under jeans or slacks for any especially cold days that might crop up. Spring weather’s volatility and unpredictability can make traveling and staying comfortable a bit of a gamble if you don’t prepare ahead of time. Keep an eye on the weather, and pack the items listed here for a springtime trip to the Niagara region that will keep you warm, dry, and happy.